The chemo for week #2 (last week) and week #3 (beginning today) is the same. It is Methotrexate. The side effects of Methotrexate aren’t nearly as severe as the first week’s combination drug. However, nausea is a common side effect as well as severe mouth sores. A little over a week ago, I drove by the billboard above. 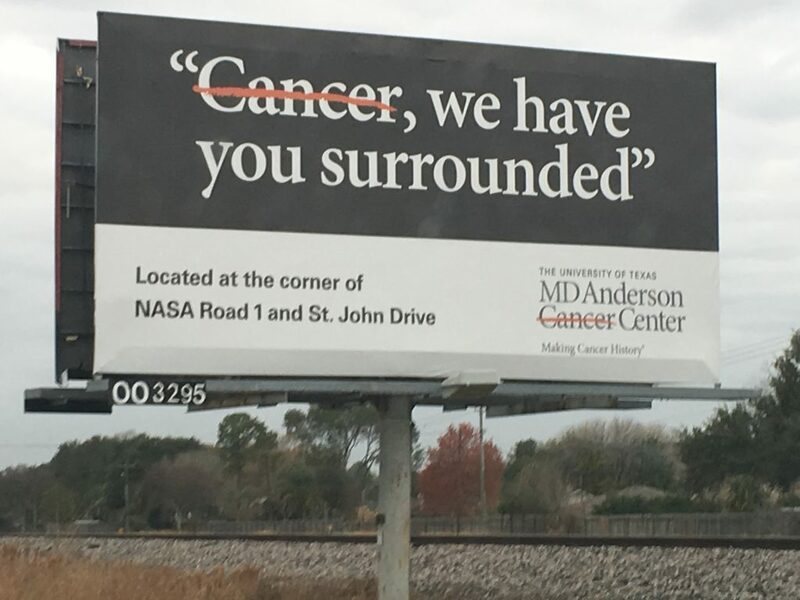 I’m sure I’ve driven by many MD Anderson billboards, but now I see them everywhere. Whenever I see one, it is a reminder that I am thankful that we were living in Houston when Emily’s cancer was discovered. We checked in last Tuesday (January 9). Before they begin the chemo, they connect Emily to her port and hydrate her and fill her with fluids. Once they put the chemo in, they want it back out quickly. In the middle of the night – around 2:45 AM, they put the chemo in her body. It only takes about four hours for the chemo to get into her body, and she spends days getting it out of her system. She felt nauseous the next day and on day 3, she threw up. But overall, the side effects were less severe than the combination drugs given in the first week of chemo. She felt pretty good for a couple of days also, but she has no appetite while going through chemo. She rarely eats anything while going through chemo and recovery. Since Osteosarcoma is an aggressive bone cancer, they aggressively treat it with potent chemo. That is why it requires in-patient chemo treatments. Methotrexate can cause liver damage if in your body too long, so they measure every 24 hours how much is left in your body. Once is it less than .1 micromoles per liter in your blood, you get discharged. Typically, it takes 72 hours (three days). 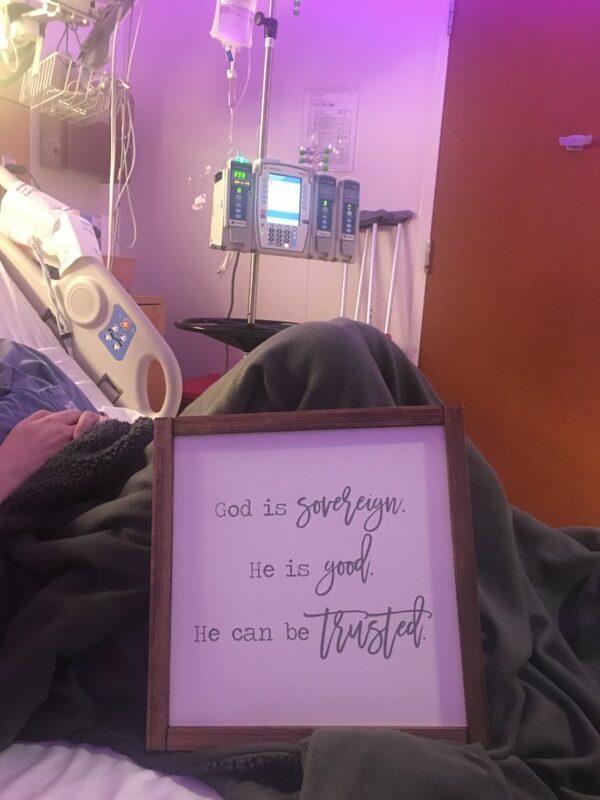 For Emily, she was in the hospital six nights. She went home Monday late morning and they had us come back Thursday morning for this next round. She enjoyed her three nights at home and basically feels close to “normal” during those days, but without much of an appetite. It was great to have Morgan and Cory here last week. One morning while driving to the hospital, I saw this rainbow (below). 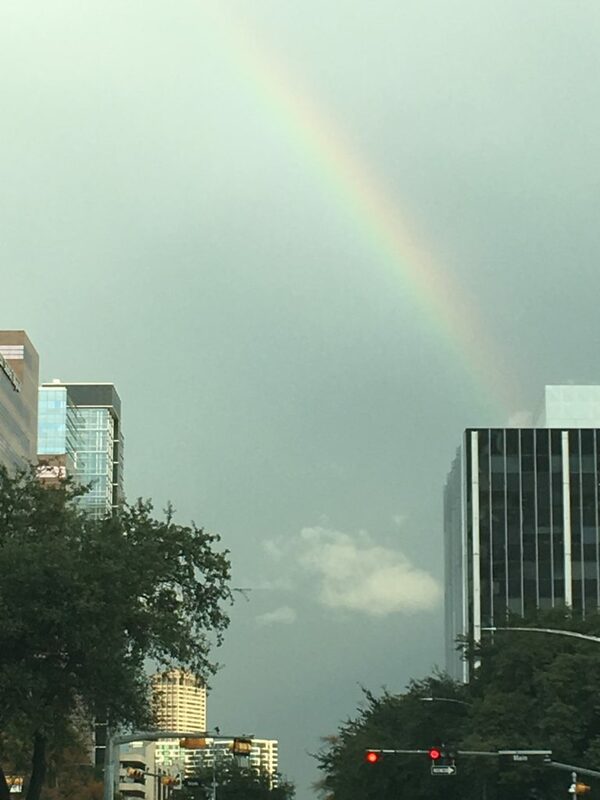 The rainbow looked like it ended at one of the buildings at the medical center. It was a great reminder of the promise of the rainbow (that God won’t flood the earth again). But for me, it was a reminder that God loves my little girl more than I do, and He will do what is best. Emily continues to use crutches. And that is becoming more difficult because the chemo is killing the cancer, so she hardly has any pain in her knee. So it is tempting to use her leg as normal, but the oncologist is strongly telling her to not bear any weight on her leg. The reason is because the cancer has weakened her bone significantly, and it could easily break. If it breaks, the cancer can easily spread and the only option is amputation. So she does pretty well at faithfully using her crutches, though not as well at home. This morning we were at the hospital at 8:00 AM for lab tests and meetings with the oncologist. This afternoon we were checked in for chemo, and now Emily is getting fluids in her through her port. Tonight, around 10:00 PM (central time), the four hours of chemo will begin. Then we will spend the next few days flushing it out of her system. I am still working. My travel schedule has been lighter but not eliminated. This week I will leave on Monday morning and get back on Wednesday. If Emily “clears” in 72 hours, she will be released Sunday morning. If it is like last week, she won’t be done until Wednesday. Emily asked you to pray that she will clear more quickly so she can go home earlier. After six nights in the hospital last week, I’d love it to be only 4 nights and go home on Monday morning. Continue to pray that the chemo would be potent in killing cancer and weak in its side effects. Emily would love to not throw up this week. This particular med causes painful mouth sores. She is doing some preventative measures to avoid them. She currently has two minor sores that are manageable. Pray that not many more develop over this treatment. We came to MD Anderson as our first choice. For many, it is their last option. We are meeting a lot of those families. There is one family who recently found out there is nothing else the doctors can do for their son. His cancer started as osteosarcoma but has continued to spread. And now, although they are continuing treatments, the cancer is not shrinking. Could you pray for Tommy and his family? He is an 11-year-old boy. The family has a strong faith in Christ, but our hearts break for them. 1) How could I get one of the t-shirts you and your family were wearing in the photo you posted with the last blog entry? Emily and the entire Whiting family are in my prayers every night. The “valley of death” referenced in Psalm 23 comes to mind when I think of going through cancer treatment, or any Extremely Trying and Difficult time. God is with Emily, and he is with you, David. He is with Sue, Allie, and Morgan. He is with Tommy and his family (my heart breaks for them as well). 1) You might see if MD Anderson sells them on their website. Just want to let you know that our Lifegroup at Hope church has been lifting Emily, and your family , up in prayer as she takes each step of this journey. May she, and each of you feel the Lord’s loving arms, and His healing presence.